It’s hard to believe it’s been less than a year since we moved to our new office! After months of planning and the move, our team is thrilled to be working and serving our patients in a true state of the art facility. Here are just a few things we love about it and know you will too. Patients just out of surgery arrive through a VIP entrance and are seated in a separate private waiting area. This offers privacy for all patients who do not look or feel their best just after surgery. It also allows our nursing staff to fast track the patients into an exam room. The overall flow of the exam rooms, spa rooms and Ambulatory Surgery Center (ASC) makes for perfect communication between departments to facilitate the best patient care. 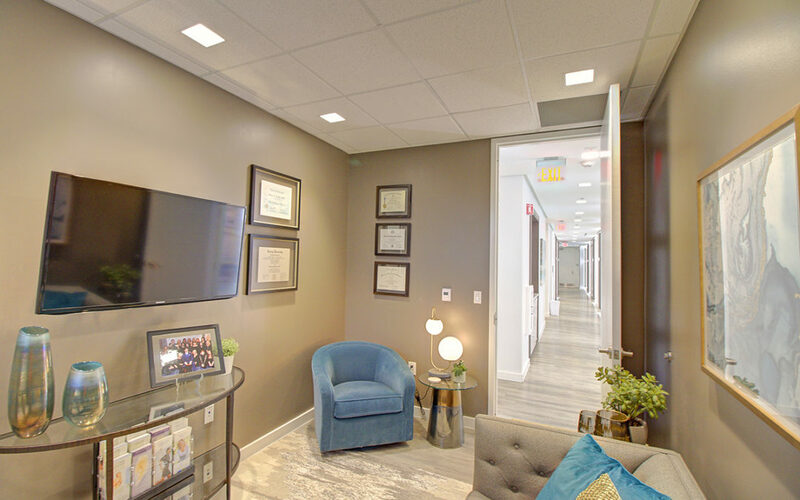 We now have two private consult and pre-op rooms equipped with 3D technology allowing our team to review pre-op 3D before photos, as well as provide visualization of incisions and simulation of probable results for patients. Our medspa now offers a Life Viz 3D camera system. This technology allows for visualization of sun damage, hyperpigmentation and many other innovative tools. Our new office offers a separate family waiting lounge that features a nutrition station, coffee bar and beverage center. This room allows access to both the main waiting room as well as access just off the ASC for quick updates from the nursing staff assigned to their loved one. It has always been our goal to help you work toward the best version of yourself. We have that same goal for ourselves! A version that was designed for the entire Graivier Center family, employees and patients – a space that invites everyone in and just feels right. The feeling that allows us to celebrate how our beautiful tenured employees can continue to greet patients year after year. It is that celebration that allows us to care for generations of patients and families who trust us to provide care that goes above and beyond their expectations.